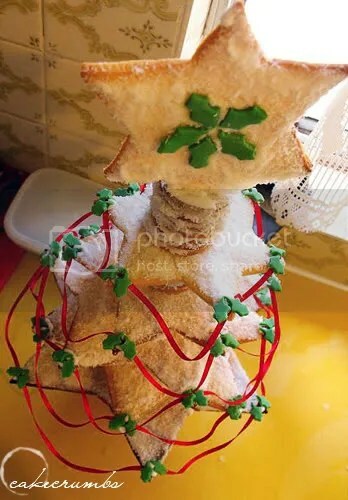 Here’s for the final instalment of my Christmas bakerage 2010: the cookie tree. This tree marks a pretty important milestone for me. See, this time last year I was failing with fondant. I couldn’t even get holy leaves to work for the cookie tree. So it had red berries and that was it. While this tree involves minimal fondant work, it reminds me of how much I have learned in a year. It also reminds me that I have so much more to learn, and so much more time in which to learn it. I’m forever getting frustrated at my ‘failures’, never happy unless it’s perfect (which it invariably never is). This reminds me that I haven’t been at this long; so here’s to a chin up and hopefully many more successes (or should it be less failures?) for 2011. Whilst on the subject of failures; the aesthetics of this tree is certainly one of them. But this was a last minute rush job, completed a mere 10 minutes before the guests arrived, so I threw it together and hoped for the best. 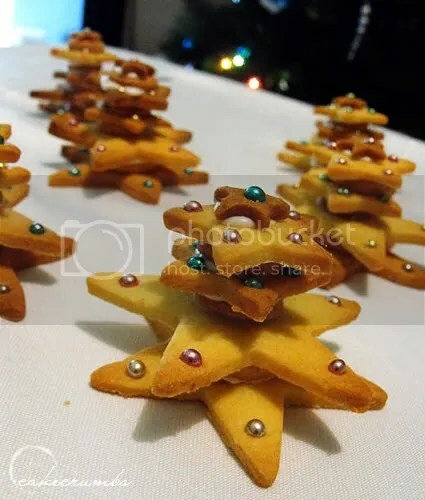 Ideally, after realising that this year’s batch of cookies was thinner and that it wasn’t going to reach the top, I should have gone back and rearranged the cookies. I didn’t have time. So this tree turned part giraffe. Not to worry. I told myself I’ll get it perfect next year. A combination of this cookie dough, and the stained-glass cookie dough was used to make these mini-trees for the goody bags. These were and absolute disaster aesthetically. The mini trees in my mind, and those on the bench were chalk and cheese. But in the end, it doesn’t matter how pretty it looks if it tastes like crap. This recipe certainly does not. 3. Wrap in foil and chill for 2-3 hours. 5. Roll out dough to 0.75cm (1/3 inch) thickness and cut out a 23cm (9 in), 20cm (8 in), 18cm (7 in), 15cm (6 in), 12.5cm (5 in) and 10cm (4 in) star. Stamp out a 2.5 cm hole in all bar one star. 6. Stamp out 24 x 5cm, (2 in) rounds with a 2.5cm hole in the centre. 8 Cover the cookies with royal icing, then sprinkle with desiccated coconut. 9. Secure dowelling to pot or cake board. 10. Layer stars and circles on dowelling to achieve desired height. 11. Stamp out holly leaves from fondant; attack two to each point of the star. Pipe on red holly berries with royal icing. Drape red ribbon around the tree.